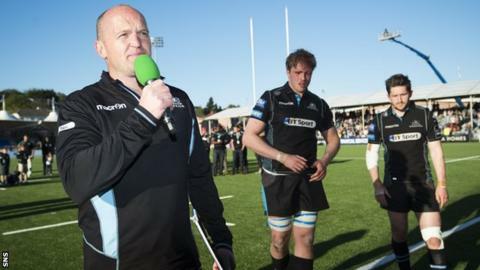 Departing Glasgow coach Gregor Townsend rued his side's inability to take their chances after slipping to defeat by Edinburgh in his final game in charge. The Warriors could have led by more than 11-9 at half-time. "We had enough opportunities to be further ahead, and second half we made too many mistakes," Townsend said. "Edinburgh took their chances. It took a bit of character and skill from us to get a chance to win near the end, but we weren't nearly good enough today." Glasgow had the small consolation of winning the 1872 Cup for the first time in three years, prevailing 43-41 on aggregate after winning the away leg 25-12 at Murrayfield on Boxing Day. "[That's no consolation] at the moment, but in future that's something on record," Townsend told BBC Scotland. "Our players are obviously really disappointed, they wanted to finish the season with a win, and it shows how competitive these fixtures are. "I thought Edinburgh played really well in defence, and really stopped us creating quick ball. That's a credit to them, and they took their chances really well as well, so they deserved to win today. "Even though we were getting penalties a lot around the breakdown we didn't convert our opportunities with the line-outs we had close to the line." After reaching the Pro12 semi-finals for the past four seasons - reaching the final in 2014, and winning the title in 2015 - Glasgow had to settle for sixth place in Townsend's final campaign, but reached the European Champions Cup quarter-finals for the first time. Townsend addressed the Scotstoun crowd after the final whistle, thanking fans for their support, and will name his first Scotland squad on Monday as he takes over the national job for the forthcoming southern hemisphere tour to face Italy, Australia and Fiji. "I'll miss it a lot," he reflected of his final Scotstoun experience as head coach. "We've got the best supporters in the world and we're just disappointed today we weren't able to give them the performance they deserve. "Just now I'm still a bit down, but I'll miss coming to work, I'll miss working with this group of players and I'll enjoy coming back and watching, seeing how this club continues to progress, getting more and more people watching and also playing some really good rugby."